This summer! Pleasant and long. Most of the time I played and sewed and crafted with my daughter. The boy is having his own private computer time and we let him. and finally. The Kids started school yesterday, after 3 months teacher's strike. I'am going to push myself a bit, as I really forgot how to speak English. I was totally mentally adsorbed by the idea of a "21 days sewing blog post challenge " to give myself some pressure, until I opened this blogging system and typed in my password, which surprisingly, I did not forget. I saw my unfinished "101 reasons to sew", I did one reason. another reason to sew is to print on the things you sew. I think it is a proper reason. 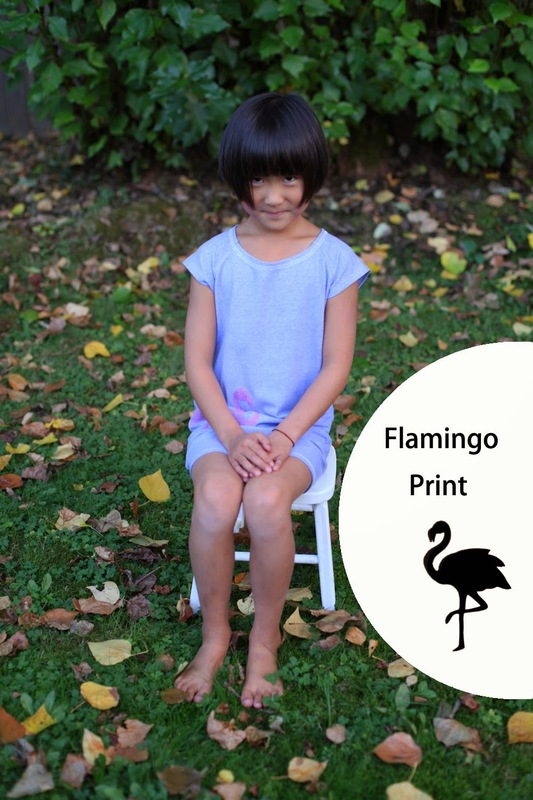 most templates don't have loose parts but for this flamingo, I like it's standing-on-one-leg pose. Secure the cut out stencil using weights. Sprinkle some sparkles. optional or just use sparkling fabric paints. wait until dry (24 hours ? )and iron. Sew a Tee shirt using your painted fabric. Will post another post tomorrow and continue everyday for 21 work days.